The Upside of a life turned upside down by chronic pain. "Backbone" will be published by Arcade on November 7th. There is pain that hurts you and pain that changes you. Acute physical pain is a signal and a survival mechanism. In the short term, it compels you to do something to avoid or diminish it-pull you hand back from the hot stove, jump back from the prickly cactus. Acute pain is usually caused by tissue damage and will resolve over a period fewer than three months. It hurts, but it will go away. You’ll get better. You’ll go back to being the person you were before. When your condition progresses from the acute to chronic, meaning the pain lasts longer than twelve weeks, this long-term distress is the pain that changes you. There is physical pain, but there may be no visible injury. It’s inside, in the nervous system. It is invisible. The nerves never stop firing, sending a constant pain signal to your brain. You cannot jump back from this pain. It follows you and you have no choice but to reach an accommodation with it. You can medically dull it or mentally distract yourself from it, but you can never escape chronic pain. The English word “Pain” is rooted in the Latin “poena” meaning “punishment” and “penalty” as well as the sensation one feels when hurt. Chronic pain is like serving a life sentence for a crime you didn’t commit. One of the punitive effects of pain is that it is unsharable-it is difficult or impossible to express. To the sufferer, the pain cannot be denied. To the person next to her, the pain cannot be confirmed. Pain is subjective. It is unknowable unless you are afflicted with it. We tend to deny the pain of others because we cannot see it or feel it. It is mystifying to us, unreal and frightening. We don’t want it to be true because we all fear to be in pain. Pain means an illness. Illness means limits and loss of freedom. If we admit someone else’s suffering, we admit the possibility that we might suffer, too. Yet one-third of Americans have some type of chronic pain. That’s over 115 million, more than the number of people who suffer from heart disease and diabetes combined. So why is it so hard to talk about pain? In “The Body in Pain”, Harvard professor Elaine Scarry writes, “Physical pain does not simply resist language, but actively destroys it.” She studied the effects of severe and prolonged pain and noted that “Pain is resistant to lingual expression,” and this is part of the isolation that pain sufferers endure. A person in pain is bereft of the resource of language. She cites Virginia Woolf, who wrote “English, which can express the thoughts of Hamlet and the tragedy of Lear has no words for the shiver and the headache..the merest schoolgirl, when she falls in love, has Shakespeare or Keats to speak her mind for her, but let a sufferer try to describe a pain in his head to a doctor and language at once runs dry”. Physical pain is isolating. Its inexpressibility and incomprehensibility separate you from your family and friends. My husband and son have no idea what it is like to live with chronic pain. They, like most people, have a narrow frame of reference for how to comprehend pain. Their sprains and stitches and dental visits are finite, a sprint through pain. My chronic pain is an unending marathon of physical distress. They can’t see the agony of the evil parrot perched on my shoulder and pecking my head and neck with its razor-blade beak. The torment that bursts in my neck and ruptures through my central nervous system is invisible. From the moment I wake, before I even open my eyes, the pain detonates on the right side of my head, from the top of my ear through to my neck and shoulder. Then it jumps down my spinal column and over to my left elbow, igniting a searing, burning sensation that makes my left-hand contract into a sad claw, a collapsed fist of fingers. The intense never jangling vibrates down my spinal column to my feet, where both big toes feel like they have been snapped into a pair of rat traps. I’m amazed that my guys cannot see the raw pain in my body. How is it not visible? How can it not radiate out of me like the little jagged lines and stars emanating from an injured cartoon character? The toughest part of my day is waking in the morning, arising with pain, swallowing and then waiting for the medicine to kick in. It’s like waking up with the most insane hangover, but I didn’t get to have the fun of getting hammered the night before. When the pain is at its worst, my head is tilted to the right like a broken Pez dispenser. I cannot tolerate the slightest touch: even wind with sting my neck. When air hurts it is termed allodynia, meaning a painful reaction caused by a stimulus that would not normally cause pain. Sensations from showering, wearing a collared shirt, having hair strands brush against my neck, or even a light breeze can cause allodynia. Most pain serves a purpose, to protect an injured area. Allodynia flares pain for no useful purpose. I take strong prescription medications to tamp down the burning, biting sharp sensations. Before the medicine takes effect, it feels like a donkey wearing hockey goalie skates is kicking me in the neck. After I take my medication, it feels like the jackass put skate guards on, but he’s still kicking. Other than my talking or writing about my pain, there is no obvious indication for people to recognize that I’m seriously ill. You’ll see my defensive stance, ready to avoid the anything that might touch my neck. You will not see my affliction. The granulomas and lesions are knotted up in my spinal cord and in my central nervous system. I have an invisible illness. The invisibility is two-fold as on the days I’m enduring a pain flare and am roped to my bed like Gulliver, I am housebound. I am invisible in my community on these days. 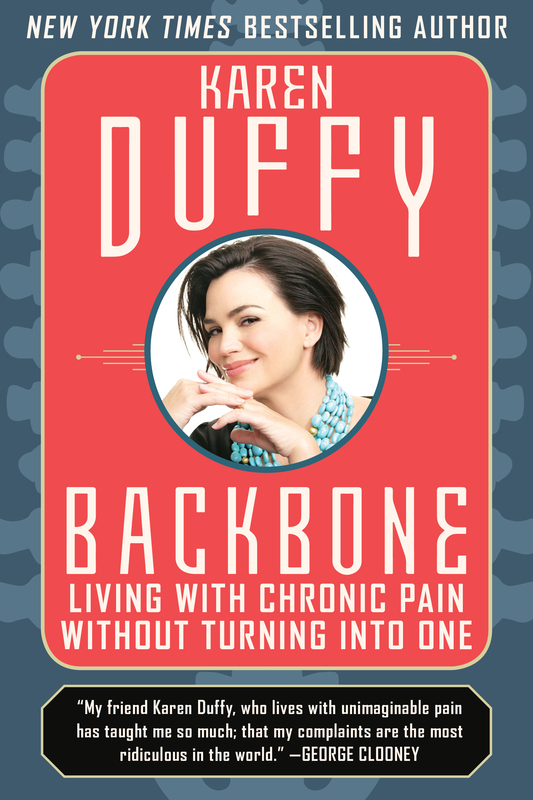 Karen Duffy is an NY Times Bestselling author, her new book "Backbone, Living With Chronic Pain Without Turning into One" will be published Nov 7th.